Faraday Future's FFZERO1 Concept wowed crowds in Las Vegas. The company promises a $1 billion investment to build a car plant nearby. Is a planned $1 billion electric-car factory in suburban Las Vegas the savior for an economically ravaged community -- or just a desert mirage? That's the unsettling question facing officials in Nevada, after they approved as much as $215 million in tax incentives and credits in December for a plant being developed by the mysterious electric vehicle startup Faraday Future. One reason for the concern: financial uncertainty surrounding Faraday's main benefactor, the billionaire Chinese tech entrepreneur Jia Yueting. 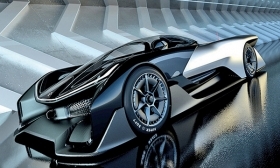 Faraday, which dazzled Las Vegas at this year's Consumer Electronics Show with its FFZERO1 Concept and talk of a broad lineup of EVs in coming years, has promised to invest $1 billion over the next 10 years in a factory that would ultimately employ as many as 4,500 people. The company has started clearing land at the North Las Vegas site and expects to break ground in April. But now Nevada is tapping the brakes on some of the subsidies until Faraday can prove that it has some cash of its own. The state is requiring Faraday to put up as much as $75 million as collateral before Nevada begins to issue bonds for infrastructure projects it has pledged around the 3-million-square-foot site. "My responsibility is to the Nevada taxpayer," said state Treasurer Dan Schwartz, who supported invoking the collateral requirement. "I'm personally and the office is very much in favor of economic development, but what we don't want to happen is to issue bonds that won't be paid." The move highlights the tension between fiscal and economic concerns in places such as Nevada that are struggling to rebuild their battered tax bases through manufacturing. These communities are willing to make big bets for the sake of business activity -- in 2014, Nevada approved $1.25 billion in incentives for Tesla's battery plant near Reno -- but they are also wary of a double whammy to taxpayers if the big plans don't pan out. Schwartz, a former banker who lived in Hong Kong on and off for 12 years, says he began to worry about Faraday's finances after trading was halted in shares of Jia's online video company, Leshi Internet Information & Technology Corp., on China's Shenzhen market in early December, pending what it called an internal reorganization. Trading was to resume on Jan. 31, but that date has been pushed back to March 7. Schwartz was spooked enough to do some digging this month during a Lunar New Year vacation to China with his wife, a Chinese national. He said conversations with two people -- a personal friend and a top banker in China, both of whom he said are generally familiar with people in the market who interact with Leshi -- left him with doubts about Leshi's ability to finance Faraday's plans. Faraday declined to make any company officials available for comment but said in a statement to Automotive News: "It is our policy not to discuss our funding." Leshi, for its part, has seen blistering growth in recent years. It posted 2014 revenue of 6.8 billion yuan (about $1.1 billion), nearly 30 times what it generated in 2010. It earned net income of 364 million yuan (about $59 million) for the year. Steve Hill, who heads the Nevada Governor's Office of Economic Development, initiated the call for the collateral requirement but sounded far less concerned than Schwartz. Periodic halts in stock trading are "not uncommon" on China's volatile markets, he told Automotive News. Moreover, he said, Nevada has taken other steps to protect its investment, including a trust fund to recover tax abatements until Faraday meets its promise of $1 billion in investment. "The agreement we have made is very performance-based," Hill said. Hill said Faraday presented a unique opportunity to revitalize the large, undeveloped Apex Industrial Park site in an area of North Las Vegas hit hard by the housing crisis. "You need a project that's the size of Faraday Future in order to actually justify doing that," he said. Schwartz said that after his return from China, he met with David Wisnieski, Faraday's finance director, and Dag Reckhorn, vice president of manufacturing, at the company's request. The executives were resolute in their commitment to the Nevada site, Schwartz said. They agreed to meet again after Leshi shares resume trading on March 7. If that's put on hold again? Schwartz said, "We'll cross that bridge when we come to it."